Does motor regenerative energy damage the power network? Home » FAQ » Does motor regenerative energy damage the power network? Today I discussed with my colleague at work (Electrical Engineer) about the regenerative energy when come back to the network it causes damage or short circuit with the line as he said because the frequency of the regenerative energy is not match with the frequency of the network. His point of view that the induction motor its rotational transformer when the induction motor run as generator the speed of the rotor will be faster than the synchronous speed which means the frequency of the rotor above the line frequency, so it will induce energy to the stator or the network with different frequency and not match will the original frequency. The frequency of the distribution system is fixed. When applied to the stator of the motor, it induces a rotating magnetic field in the motor that spins at synchronous speed defined by the equation S=120F/P where F is synchronous speed in RPM, F the applied frequency in Hertz and P the number of poles, always a multiple of 2. 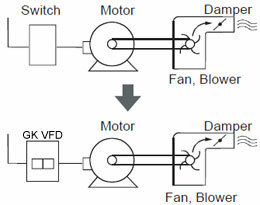 For a two-pole motor operating at 50Hz, the synchronous speed is 3000 RPM. The rotor of the induction motor is affected by this rotating magnetic field, and a current is induced in the rotor as long as there is a speed difference between the rotor and the field (lines of magnetic flux cutting through a conductor that makes a closed circuit). The induced current produces a magnetic field of its own, and the two fields interact to produce torque on the rotor, inducing it to spin. What happens if you overdrive the motor? The rotor is still spinning inside a rotating magnetic field, it's just doing it FASTER than that field. Current is still induced in the rotor, that current produces a magnetic field, and the fields still interact, but this time the torque produced is NEGATIVE, or in the opposite direction of the rotation of the shaft. It doesn't affect the utility frequency any more than rotor slip below synchronous speed would. 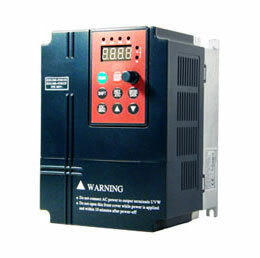 If you have a two-pole motor nameplate rated 2950RPM at 50Hz and you drive it to 3050RPM while connected to utility power, it will be absorbing 100% rated torque and regenerating 100% rated current to the utility - at 50Hz. There is no way that a small motor can affect the line frequency applied to it when the line power is supplied by multi-megawatt generators.